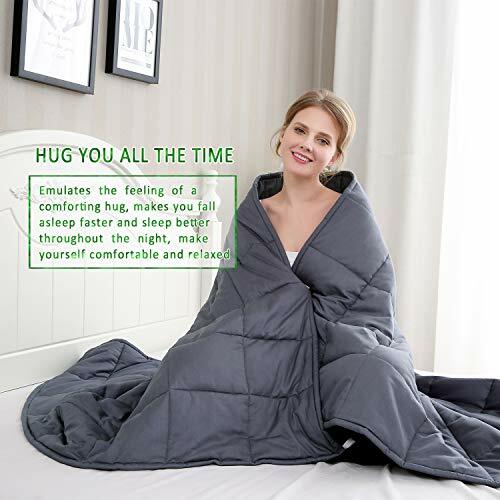 The proper size of blanket for everybady is determined by taking 10%-15% of the one’s weight plus an additional one poundSize: 60″x80″, Weight about: 15lb, suitable Body weight: 140-150 lbs. Choose the blanket that weighs about 10%-15% of your body weight plus one pound, the weight would help you sleep better and faster. Due to its weight, a twin, full or queen size weighted blanket is supposed to on the mattress and should’t go over the edges of the bed. 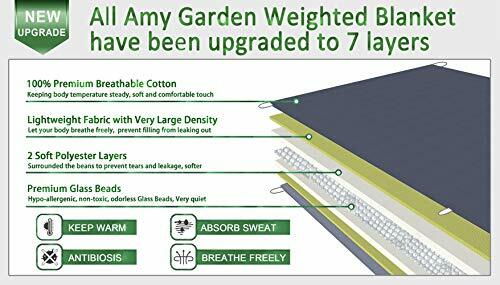 We’re always trying to improve Amy Garden blanket quality. 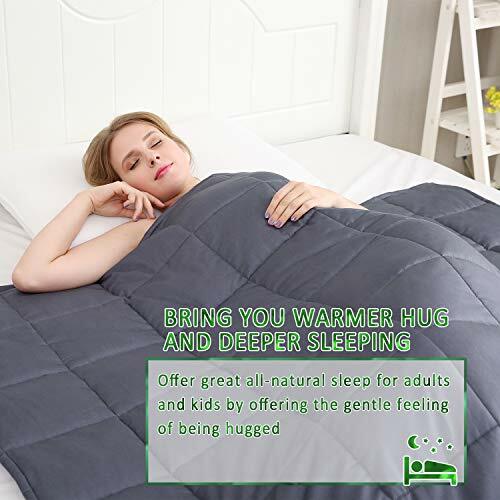 Now we have made great update on our weighted blanket. Specially customized better quality cotton cloth can provides smooth breathable touch feeling. 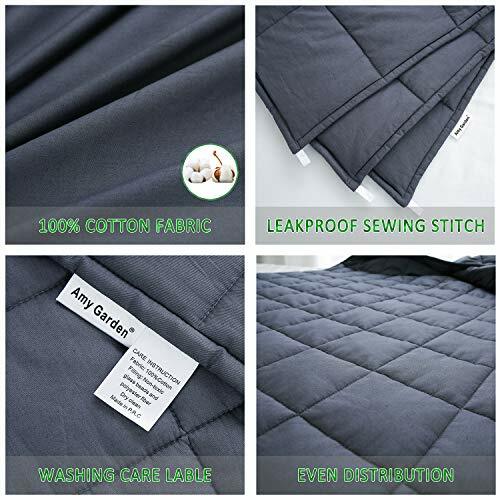 In addition, the updated weighted blanket adopt more durable cotton thread and very dense sewing process to prevent the blanket leaks glass beans. 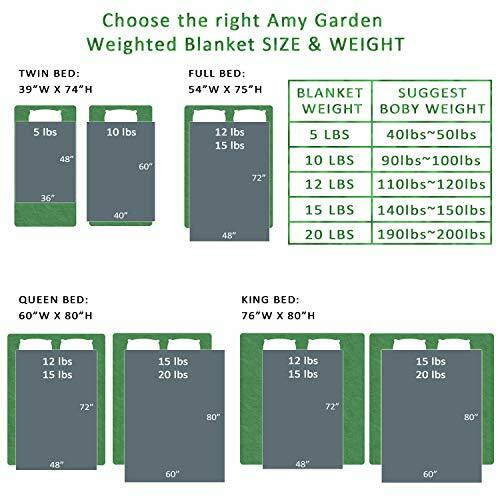 Amy Garden weighted blanket is a wonderful sleeping gift for ANY HOLIDAYS (Christmas, Thanksgiving Day, Halloween, Valentine’s Day, New Year’s Day, Easter Day, Mother’s Day, Father’s Day,Birthday); ANY OCCASIONS (Back to school, watching TV, reading or just ideal to cozy up on the couch for a blissful nap or relaxing at the end of a long day); ANYONE YOU CARED (kids, parents, lovers, friends ), give your loved ones the deeper sleep and inner peace they’re looking for. The weighted inner layer and the duvet cover are sold separately! We suggest you buy weighted blanket together with a duvet cover, so when you want to wash it, you can just need take the cover off for a quick wash and dry. Some people do not recommend using. 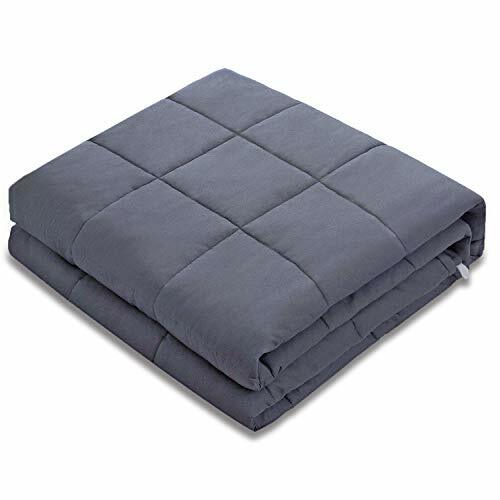 Physically weak people DO NOT recommend using this blanket, Or choose lighter weight blanket. Pregnant women, babys and sick patient are prohibited to use.